Just days after marine mammal experts staged a mock whale stranding exercise at Banff Links in NE Scotland, the team were involved in a dramatic real-life rescue operation. 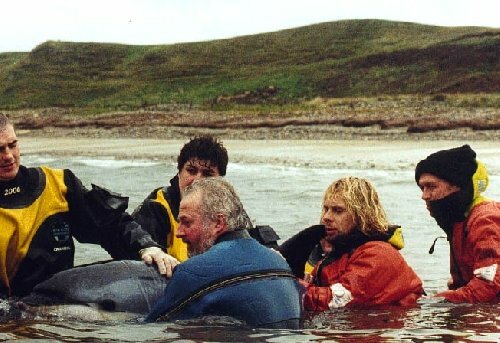 Six Atlantic white-sided dolphins became stranded at Brora on the northern shore of the Dornoch Firth, and the Gardenstown-based Cetacean Research & Rescue Unit swung into action. An RAF Sea King helicopter was scrambled from Lossiemouth and picked-up the team of 10 rescuers from Royal Tarlair golf course for a 16 minute flight to Brora, where they were united with members of the British Divers Marine Life Rescue, the SSPCA and the coastguard. Dr Kevin Robinson, senior rescue co-ordinator with the CRRU said: "I couldn’t believe we got to Brora so quickly. It would have taken in excess of 4 hours to get there by road, and we are really very grateful to the RAF. When we arrived at the scene we found 6 casualties - 3 males, 2 females and a young calf. Only 3 of the adults were still alive when the first members of the rescue team arrived, but one passed away very shortly afterwards, leaving an adult male and an adult female to tend to, which we affectionately named Bonnie and Clyde". The dolphins had stranded in a rocky area and had to be carried, one-by-one, to a sandy stretch of beach over half a mile away. Here they were examined by a local vet and given appropriate treatment. Both of the mammals seemed to be good candidates for refloat, and so ensued a long 4 hours in the freezing North Sea waters with the dolphins - supporting them in the water and massaging their fatigued muscles back into action. "After several hours of attention, Clyde had begun to respond to our efforts and was starting to drive his tail" said Dr Robinson, "but poor Bonnie was not really showing any significant improvement. We held Clyde back to gather more strength and turned him to face Bonnie while we worked on Bonnie harder. But as the light began to fade, and the condition of the female failed to improve, we decided to release Clyde who thankfully headed straight out to sea." Sadly, after 8 hours trying to revive the female dolphin, Bonnie’s condition deteriorated still further and she had to be euthanised by the vet. This was extremely hard for the rescuers who had spent so many exhausting hours with her. Heartfelt thanks go out to all those who assisted in the operation: the RAF, BDMLR, SSPCA and the SAC.